For travel tips, events, art history, and lifestyle information on Florence and Tuscany, including the locations listed below, consult Arttrav, a website written and maintained by a travel-blogger located in Florence. In your accommodation at Il Poggiolo you will also find guide books and maps to use during your stay, but for advance planning, Arttrav has some recommended books listed here. The nearest train station is “Montevarchi –Terranuova” on the Florence to Rome/Chiusi/Foligno line. Given the parking problem in all of the Medieval cities in Tuscany, it is often advisable to park your car at the Montevarchi station and just take the train. Ticket one-way to Florence costs €6.20 (reductions for children under 12). Taking the train for a day trip is a good idea (above all to Florence), especially if you calculate the cost of gas and parking (not always easy to find). Cities easily reached by train from Montevarchi include Florence, Arezzo, Cortona, Orvieto, Pisa, Lucca, and even Rome. 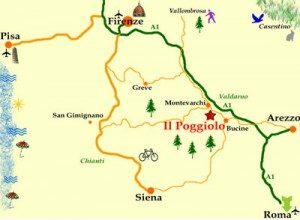 Trekking – in both the Apennine Mountains and the Chianti hills (trails marked courtesy of the CAI – Club Alpino Italiano). Country Walks – Just stroll out your front door and walk along the country roads in the neighbourhood. See sunflowers turn as the sun moves across the sky, grapes ripening on the vine, olives being harvested in the late fall. The village of Mercatale is only 3 km. away, a 45 minute stroll. A slightly more challenging jaunt (5 km.) brings you to the 12th-century tower of Galatrona (open on weekends) from which there is a view of the entire Valdarno and Appennine mountain range. Don’t forget to enjoy a cappuccino or gelato at the local café before you walk home! Natural Parks – the Parco dell’Uccellina south of Grosseto, Pratomagno in the Apennines, and many others. Thermal baths – Rapolano, Bagno Vignoni, Petrolo, Saturnia and many more. “Croccodile”: Near Arezzo. Artificial waves and water slides and cafés and pizzeria. Municipal pool in Montevarchi with diving board and local kids who strike up conversations in halting English. “Las Vegas” in San Giovanni Valdarno with water slide and pizzeria-café. Pools at Capannole (near Bucine): fewer people, more up-scale (better for adults), with trattoria & café – can get crowded on weekends in July/August. County fairs, Gastronomic fêtes and Town holidays (for patron saints) – See announcements of upcoming “sagre” (town fêtes) in Tuscany and other events posted on Artrav (website). Historic re-enactments: the Palio of Siena, the Gioco del Saraceno in Arezzo, the Calcio Storico match in Florence, and many more – see the “Local Events” page.